The February German report on industrial production shows a 0.7% gain after a flat result in January that has been revised up from a decline previously. The industrial sector is mixed. The headline shows a 5.9% annual rate of increase over three months, up from a 1.3% drop over six months and a 0.5% decline over 12 months. On that same timeline, consumer goods output is flat over three months, falling at a 14.2% pace over six months and falling by 4.3% over 12 months. Intermediate goods output falls on all the timelines in this sequence but shows no clear accelerating or decelerating trends. In the quarter-to-date, IP is up on the strength of rising construction as all three manufacturing sectors show declines in progress. 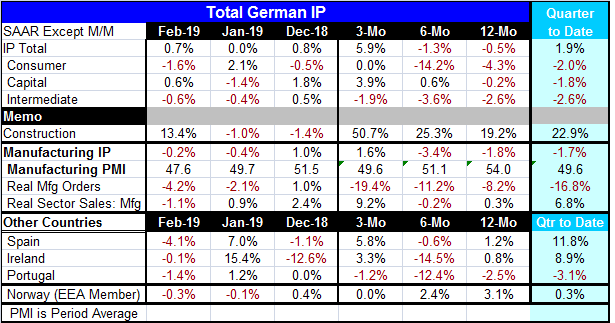 Manufacturing IP also shows no clear trend on the sequential timeline presented below (12-month to 6-month to 3-month) and it shows a decline of 1.7% annualized in the quarter–to-date. The manufacturing PMI for Germany is below 50, showing contraction and is below 50 even over the last three months during which manufacturing output is showing some revival (rising at a 1.6% annual rate). And with manufacturing output falling by 0.2% in February, the manufacturing PMI for Germany has moved further below the 50 mark, dropping to 47.6 from January’s 49.7. Meanwhile, the headline for overall industrial production is showing expansion; it’s on the back of its nonmanufacturing components. But the manufacturing IP and the PMI index are more or less on the same page about what is happening in the German manufacturing sector. The table also shows ongoing weakness in real manufacturing orders and in real sector sales in February. Over three months, however, there are increases in manufacturing output and in real sector sales while real manufacturing orders are falling sharply and the PMI lingers below 50. There are also some early readings for other EMU nations. Spain, Ireland and Portugal each show a decline in output over six months. These drops follow what are – for the most part- strong gains in January. Spain and Ireland show output increases over three months while Portugal shows a decline. Year-on-year Spain and Ireland show output increases while Portugal shows a decline. In the quarter-to-date Spain and Ireland show increases in output while Portugal shows a decline. The year-on-year changes in IP are small, but in the quarter-to-date Spain and Ireland show substantial increases while output in Portugal falls at a 3.1% pace. Manufacturing is clearly under some stress in Europe and Germany. It is still not clear where manufacturing goes next. The German details show some stirring in the production of capital goods sector, but there is weakness elsewhere and severe weakness in German orders. The manufacturing PMI gauge shows severe weakness not just for Germany but for the EMU, and so far the services sector has been resisting further weakness. But the future is not predetermined and economic data continue to run hot and cold month-to-month. Some of it is confirming and some of it is surprising. The forecast is still in play. But most forecasters are still cutting their outlook at this time even as markets are beginning to sense that this was only a lull and as there is a creeping belief that activity may be about to catch on gain. Will it? We will see.